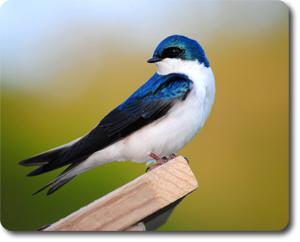 "Steel Brilliance" The simple beauty of the Tree Swallow is unmatched and they are one of the most special members of the Swallow family in North America. Seeing one of these magnificent Swallows flitting around on an early April morning after a long, cold winter is nothing but pure joy. He looks like a Prince perched atop his nesting box in this shot. Captured on Bluebird Ridge in Eastern Daviess County, Kentucky.